One of the most popular promo sets in hobby history is back with 2018-19 Upper Deck Tim Hortons Hockey. As the final days of summer ticked by, NHL collectors began to wonder if the famed coffee shop set would return for '18-19, and it makes its official debut at the end of September. The cards remain exclusive to Canadian store locations. Coming three cards per pack and 100 packs per box, discounted pricing of $1.00 per pack is unlocked based on in-store beverage purchases. Packs cost $1.99 without a beverage. There is also an official Collector's Album for $14.99. Again an issue for the release, some collectors got an early start when cards began to show up on eBay ahead of any formal announcement from Tim Hortons and weeks before the official start of the promotion. For those building the entire set, select Tim Hortons locations are hosting special "trade nights" on October 18 and October 25 alongside the Collect to Win event that officially runs until November 7, 2018. There is also a digital component to the set. Buy 2018-19 Upper Deck Tim Hortons cards on eBay. 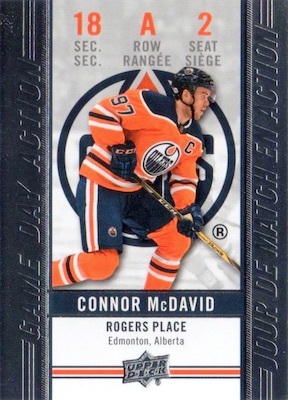 Offering the first size expansion for the modern reboot, the 2018-19 Upper Deck Tim Hortons Hockey base set pushes past the century mark to 120 cards, while earlier sets were all capped at exactly 100 base cards. Inserts include updated designs alongside new and old themes geared around some of the biggest stars in the league. Both the Clear Cut Phenoms (1:12 packs) and Game Day Action (1:4 packs) lines return from 2017-18. 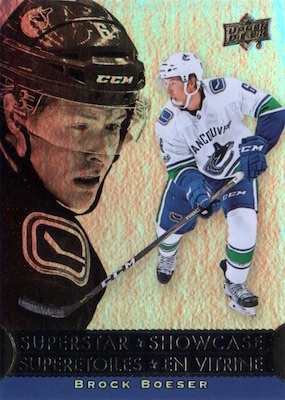 These are joined by new Gold Etchings (1:8 packs), NHL All-Star Standouts (1:3 packs) and Superstar Showcase (1:6 packs). There is also some 3D technology to look out for via the Top Line Talent (1:24 packs) lenticular insert. The 2018-19 Upper Deck Tim Hortons Hockey checklist has some very tough pulls, as well. That includes NHL Jersey Relics (1:1,800 packs), NHL Signatures (1:7,200 packs) and NHL Jersey Relics Autograph (1:82,256 packs). The 2018 NHL Draft No. 1 Draft Pick Redemption (1:15,000 packs) cards should be for the Buffalo Sabres' Rasmus Dahlin. 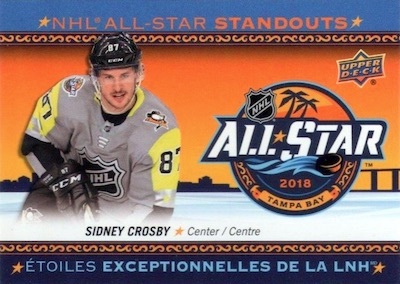 The rarest options in the set are specific to one player, including the Timbits Autograph for Brad Marchand (100 copies; 1:123,384 packs) and Superstar Signature Autograph for Sidney Crosby (87 copies; 1:141,821 packs). 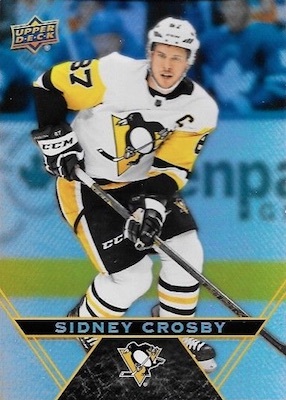 2018-19 Upper Deck Tim Hortons Top Line Talent 3D SIDNEY CROSBY #TLT-5 Penguins. 120 cards. 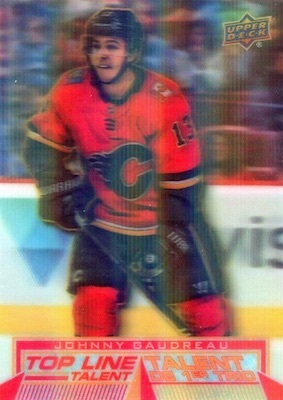 Shop 18-19 UD Tim Hortons base cards on eBay. Shop 2018-19 Tim Hortons redemption autographs and relics on eBay. 15 cards. 1:12 packs. Shop on eBay. 15 cards. 1:4 packs. Shop on eBay. 5 cards. 1:3 packs. Shop on eBay. 15 cards. 1:6 packs. Shop on eBay. below average and overly hyped and priced on packs with Tims demanding 1.99 for extra packs with just 3 minor cards in it. If you can get a complete master set with album for $250.00 about 3-4 months later why would I go through the aggravation to pay 1.99 per extra packs and paying some 675.00 for 3 boxes to possibly make the master set when i can buy it for 1/3 of that 3 months later. Not only that with seeing and reading about box/packs being searched and all the higher cards pulled from packs, would it be that hard for Upper Deck to have the boxes sealed some how, but time will tell if they have when packs go on sale in few short weeks. Hi. Please explain how come some individuals have already access to those cards before the release date et sell them on Ebay as of today. It just means they get the cards early by some means. It happens every year. It’s not fair but clearly there is a flaw in the distribution process that allows this to happen. They actually started showing up online on September 15. This is the funnest set to collect bar none. The amount of people to trade with in your local area makes it very exciting to trade sell or buy what ever you need or don’t need. The high demand makes it a little difficult if not pricey to collect due to the short time period we are given to collect but any missing cards can be picked up a few mos later for a smaller sum. Me and my kids have collected each set so far and hopefully this year will be no different. Many people buy by the case and place on Ebay before the date. It would be funny if Tim Hortons started contest off with up to 10 cards purchased at a time. I am not sure if store owners have access or not. I purchased a box this year. Usually, I buy 50 and then some more when eating at Tim Hortons as it is cheaper for the pack. I really like the Gold Etchings card this year. Clear Cut Phenoms are nice and the 3D Cards are really nice. Regarding auto’s, rookies and material cards, I did not get any in my 100 packs. Its like the lottery! This looks pretty good again this year but personally I am going to pass on it for the first time. It seems pretty much the same as last year ie some similar chase cards. A bigger base set this year as well. It seems expensive by the pack but I suppose other products with more cards per pack cost a lot more. Also it bothers me that after a year or so, like a lot of other products, you can pick up the chase cards for a lot less than Beckett pricing. For me I will just pick up what appeals to me from the set if the price for me is right. It is a fun series to open however but as I said, for me I will leave that thrill for those folks more deserving. Hope that this product creates a lot of fun. This is exactly the same as previous years – which is both good and bad. I think overall though in the hobby today this is a very accessible fun and exciting set to put together and the sheer volume of people trading for it makes it super cool. Some of the clear cut cards have a line through the card…left to right anywhere from the top to the bottom of the card.I have two cards with the line going through it.. Unless i’m going blind,there not numbered either,first time I have ever seen that! That is a lot of misprints,if that counts as a misprint. Disappointing effort Tim’s! Another cash grab by increasing base to 120. Unfortunately as a collector I’ll spend way too much money, nothing like ripping packs. But really $2 for 3 cards, and I’d really like to see a better card stock, the last few years have a too familiar look. I just bought my 4th pack with a coffee and picked up the Nikita Kucherov Signatures Card (or, rather, I entered the code for it online, and Upper Deck will send it to me). Any idea how much this might be worth? Thanks! The signed cards usually sell pretty well but it just depends on how the market treats them as more show up. A few have sold on eBay for $190-270 so far, but none were for Kucherov. when you receive the card in the mail,hang onto it,if Kucherov ever wins a Stanley Cup the value will probably increase pending on his performance. Keep the card in the case that it will come in. Or you could put it on E.bay auction,make sure the USA can view the auction,the Americans can’t get these particular cards. I have discovered my kids love getting these cards. I think the value is not in having a complete set but just sharing the joy of collecting together. We may get a set together, which would be wonderful, but for our situation, it isn’t about the value of the cards, it is the fun of opening the sets and comparing what each gets. Of course for my eldest it is also all about the chance to organize! 1. WHY, BUT WHY in the world doesn’t UD put a wrapper on the boxes to avoid any trace of fraud suspicion? As for the early release date, the eBay store who does it (2-3 weeks in advance) should be pursued in court. The problem is that not even the coffee shops don’t have the cards that far before the release, so they must get them from the production center itself of from someone who works at UD. Tim Horton coffee shops receive the cards 1-3 days before the release date. 2. The super huge odds to pull an auto/material card. The problem with collections like this one is that once they expire, they pull out from the stores the packs. So many of those autos will never see the light of the day. Any idea, someone, what happens with the unsold packs after the promotion ends? 3. The price…Ok, I understand this is a cool product and people like it, but seriously, 2$ for 3 cards is a big amount of money. I buy it every year, but let me tell you that as an average, it costs more than other non food related products. I like collecting this set, but like many people have mentioned, it’s quite pricey to put this together, of course on the flip side, the trade nights are quite popular and the immediate online value is usually quite high, but of course dwindles over time. The card stock is getting annoying imo, I’ve had several cards this year with faltered tops, fortunately they are only base set cards, but disappointing none the less. I’ve purchased the Tim Hortons cards for all four years of their existence, but this year will be the last. I usually buy a complete box of 100 packs the first day they come out and then multiples whenever I buy a drink. I like to purchase a full box, as the collation is always good, and the inserts fall as per the stated odds. First box I bought followed that pattern. No luck on pulling a redemption card (again), so I decided to try my luck on a second box of 100 at another location. As always I asked the store supervisor to grab me a full box from the back. Got home and opened the 100 packs, only to find that there were no Top Of The Line inserts (should be 4 to 5 based on the odds and my past experience) and only 4 Clear cuts (should be at least 8). Yet I got 4 Matthews Gold Etchings and up to 5 of some base cards. It was evident that someone had searched several boxes and threw the garbage packs back into one. I went in the next day and complained to the owner who basically blew me off. Stating that the store is not responsible for what you get in a box. When I mentioned that would normally apply, but not to a box that had clearly been tampered with, she basically told me tough luck and to call Tim Horton’s customer service if I wanted to pursue the matter. Which I did and got the same run around. It made no difference to them that I have spent well over $2000 on their hockey cards over the 4 years. So much for their caring about the customers. Not only will I never buy another pack of cards, I will not step foot in one of their stores again! Best set to collect every year (4 so far) as love to compare stories of what cards pulled and trading with other collectors! 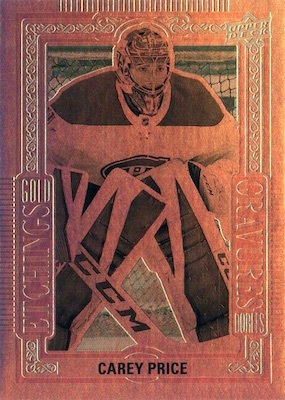 The Gold Etchings and Top Line Talent 3D cards look really nice. Clear cuts are fun to collect too and slightly easier as 1:12 compared to 1:16 past years. Don’t like seeing the base cards bent when opening packs as the cards look rather cheap in quality. Hope future years’ cards quality improve. $1.99 per pack without purchase of a drink seems pricey and Tim Horton’s should allow $1 per pack not only per drink but for food purchases too. The promotional price for the packs should not only count just for drinks. First time ever, pulled not 1, not 2, not 3, but 4 very difficult pull cards – ie autograph and relic cards. Can’t wait! We have always buy full box/sealed cases to help people complete there sets (10,000+ packs each year) but it is a sad state the hobby is getting too and the sleaze balls involved with no integrity. We got 500 packs, 5 sealed boxes we were told from a store in Kitchener, ON it was clearly filtered through as there was no Top Line or Clear Cuts in all five 500 packs. On top of that there is a fraudster running stolen credit cards through our site from Montreal trying to buy master sets, which we caught on a little late. Love the cards but expensive. I got the Sidney Crosby signed card! number 87 of 87! what would this fetch on the market? anyone know?